Fritz and Friedl, and their doting driver, let’s call him Hans, ferried us around historic Vienna for an hour one afternoon last fall. It was a piercingly sunny day and warm for the time of year. 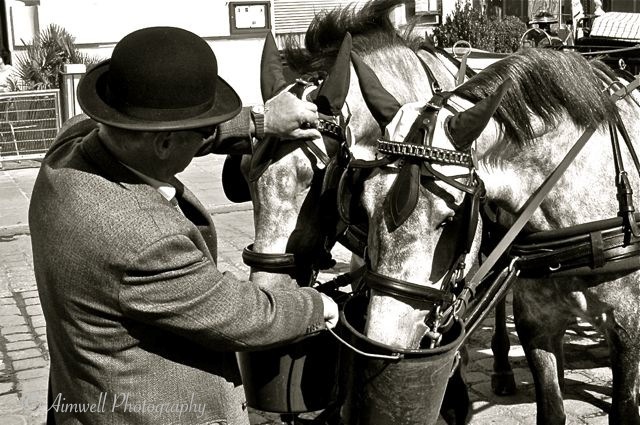 After our turn about the city, Hans filled a couple of buckets with fresh water and lovingly gave the two handsome greys a pat and a chance to quench their thirst. This entry was posted in Animals, Equestrian, Europe, Photography, Travel and tagged Austria, Equestrian, Equine image, Light and shadow, Photography, Travel, Vienna. Bookmark the permalink. Beautiful animals and a beautiful image. Black and white really adds something.